Unlike foam, matting, or other forms of static filtration media, the Kaldnes K3 media is designed to move freely within your filter. The constant chaotic movement of the air from your pump, causes the media to self clean and thus requires no maintenance. This allows the filter to reach optimum effectiveness without the disturbance of periodic cleaning, avoiding unnecessary loss of bacteria within the filter. 50 Litres of K1 media will handle up to 250 grammes of food per day and for K3, 225 grammes of food per day. 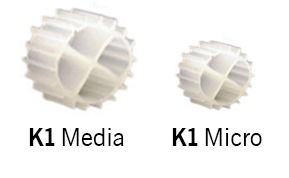 For retrofit of existing filters, K3 media is the most suitable due to its larger size and ease of control. Like K1, K3 is self cleaning and very efficient as a bio media. However it is larger than K1, K3 has a multi layer and multi spoke construction and is ideal for retrofitting into a conventional filtration system. Surface area 584 Square metres per cu.m. Kaldnes K3 is a buoyant media.